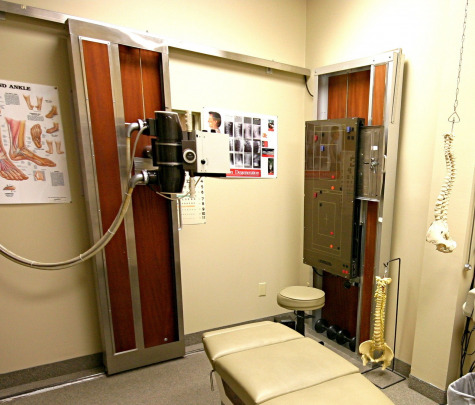 At Advanced Healthcare, we take great pride in providing the finest chiropractic wellness care to our patients. Below is a sampling of the many different chiropractic services we offer in our facility. eve pressure from the nerves and freeing the nervous system... thus creating better overall health in the individual receiving the adjustment. is a small hand-held, spring-loaded device... designed to produce a quick controlled, light-force impulse to adjust spinal joints without undue strain to the patient. The Activator chiropractic adjusting technique has been thoroughly researched for over 40 years. The impulse force can be varied and is faster than nerves can react to contract muscles. The speed allows this type of adjustment to be gentle – since there is no chance for the muscle to “flinch” (resist). So, in simple terms, the force necessary to move and adjust the spinal joint is developed by the 'speed' of the instrument's thrust, and not by a high 'force'... and is felt for the most part as a very gentle sensation only. This technique helps to restore proper balance and joint movement... and does it with improved safety and comfort. Activator is a great technique for the type of patient who does not want to hear the "popping" (cavitation) sound that is typically associated with a hands-on manual adjustment. Activator can be used on any age group, especially pregnant women, on infants when a newborn's spine is still mostly made of softer bone, children to athletes and senior citizens where a typical chiropractic thrust would be contraindicated. The activator instrument is also a very useful tool when we are treating areas around pre-existing fractured ribs. It is a nice option in many situations that chiropractors encounter in practice to help deliver a patient's manipulation that they would not be able to do manually for one reason or another. Never in the history of chiropractic have we been able to provide the level of help and expertise that now exists. These newer correction methods are even safer, more comfortable and more effective than ever before. Dr. Pisarek has over 42 years of training and experience in painless, corrective spinal and joint adjustment techniques. Click here for further information about Chiropractic. Physiotherapy - Click here for further physiotherapy information. - At Advanced Healthcare, we also teach our patients special "blueprint" exercises designed just for them to help strengthen and correct their own unique problem. These exercises can be performed in the comfort of your own home and can improve the effectiveness of your spinal correction by as much as 30-40%. In addition to skeletal misalignment, muscles and connective tissues can be out of place or strained by improper alignment and use. Specific exercises and stretches can help your body stay in balance and in health. Lifestyle Advice - We often find it helpful to "coach" our patients on certain activities they should avoid or do differently to avoid aggravating their particular health challenge. Sleep wellness is also an integral part of this advice. At Advanced Healthcare our goal is to help every patient achieve a fulfilling and happy lifestyle full of the activities they enjoy most. We recognize that each patient is a unique "whole" person, and help them reach true health and wellness via a collaborate effort between our professionals and our patients. Nutritional Counseling - We provide specific recommendations on nutritional supplements and healthy food choices to enhance our patients return to optimal health. Do you know which supplements and vitamins are good for you? Our "Health Team" at Advanced Healthcare can provide a structured nutritional program based on your individual needs. Spinal & Postural Screenings - Posture and spinal screenings can reveal important health information and unlock the door to improved health and well-being. We provide screenings at area malls, community events, health fairs and places of employment. Contact us at Advanced Healthcare today to arrange a screening at your event or workplace. in the chiropractic office. A radiograph allows us to determine if a patient's condition is treatable in our office. We rule out fracture, tumors, etc., with the use of radiographs. This is important because our primary responsibility is to make sure that we are the proper treating provider because if we are not, we will refer the patient to a healthcare practitioner that can most appropriately serve their needs. Radiographs also show us postural alignment and degenerative changes that can help to assist us in treating the patient's condition more specifically, so that we can provide out patients the most effective care for long term recovery. We refer our patients to a modern and clean radiology facility near our office that offers the highest quality HD (High Definition) Digital images at the lowest dosages. Our patient digital images are taken standing (weight bearing whenever possible) so that we can assess patient posture properly. We use all required shielding and protection for patient safety. All our patients receive a .PDF email copy of their radiology images with a printed medical radiology report for their records. Click here for more information about X-Rays.